Hunter Stadium is a multi-purpose sports arena located within the grounds of Newcastle International Sports Centre, Australia. 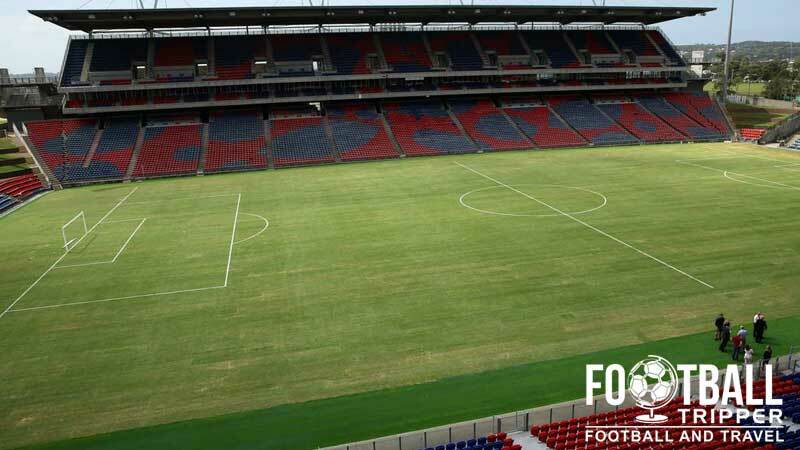 As the home of the Newcastle Jets FC, the stadium is referred to as just the Newcastle Stadium during Asian Champions League matches due to conflicting sponsorship issues. Today’s Hunter Stadium dates back to December 1967 when work began on a new multi-purpose sports venue which was designed with an oval playing surface in order to accommodate both codes of Rugby, Soccer and Cricket. Funded by the New South Wales Government, it was opened by Queen Elizabeth II three years later in April 1970 and has remained in use ever since. Home to various Newcastle based Soccer teams since 1978 such as Newcastle KB United and then Newcastle Rosebud United (Neither associated with the English Newcastle United F.C), it wasn’t until the formation of the A-League in 2005 that the Newcastle Jets have begun to use the ground permanently and look to be one of the main tenants for the foreseeable future. With old stadiums come redevelopments and the ground which first opened as The International Sports Centre has certainly had its fair share of face lifts. 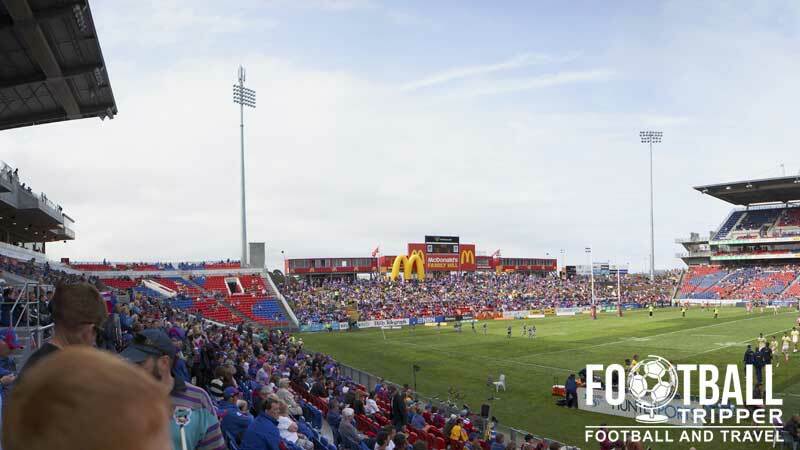 Converted from an oval to rectangle layout in 1988 by the Newcastle Knights Rugby League Team the failure to become a Rugby League Venue for the 2003 World Cup prompted two phases of council led investment. Over the course of 2004-2005 a new Eastern Stand was constructed including corporate facilities, and a new video screen. Then in 2008 federal government pledged a further $40 million Australian dollars worth of investment which resulted in four stages of development with the first part concerned with improving internal facilities such as the players dressing room and spectator concourses. Hunter Stadium consists of the following four stands: North, East, South and West. The closest pub to Hunter Stadium is probably Sunnyside Tavern which is less than 10 minutes north of the park on Broadmeadow Road, followed by The Duke which is located diametrically towards the southwest. Besides these two bars there really aren’t many places to grab a drink from with the exception of the concourses themselves which all sell a decent range of Australian and other imported lagers. South of District Park on Lambton Road there is the holy triumvirate of fastfood franchises: Subway, Hungry Jack’s (Burger King) and McDonald’s. If you follow this road for a further 10 minutes west then you will reach Gandha’s Restaurant which is a highly rated Indian food place. Besides Newcastle City Centre back towards the waterfront, the next closest strip of restaurants are all on Beaumont Street runs vertically parallel to hunter stadium’s eastern stand, approximately 5-6 blocks away. Here there are joints selling Chinese, Mexican, Thai, and your more traditional grilled food types. The merchandising kiosks and stalls selling Jets merchandise are only usually open on match days which means for people who can’t make it to the stadium the best way to buy some Newcastle goods is from the official online store. It doesn’t appear as if there is currently a tour available for the general public to undertake, with the exception of this virtual tour page on the Hunter Stadium Website. If this every changes I’ll be sure to update this page. A bunch of fans sporting the blue and red colours of the Newcastle Jets. 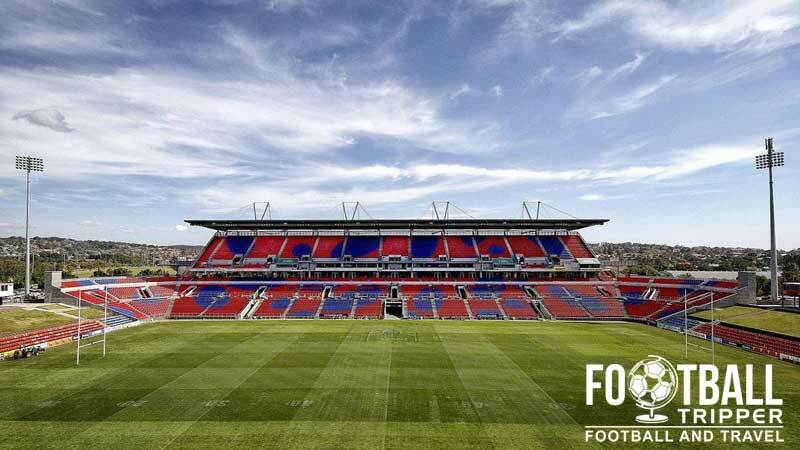 Tickets to see Newcastle Jets play at Hunter Stadium can often vary in price depending on levels of demand, and whereabouts you sit so don’t be surprised if the prices appear to fluctuate by a few dollars per fixture. The best place to compare them is on Ticketmaster who are the official ticket merchants of the club. 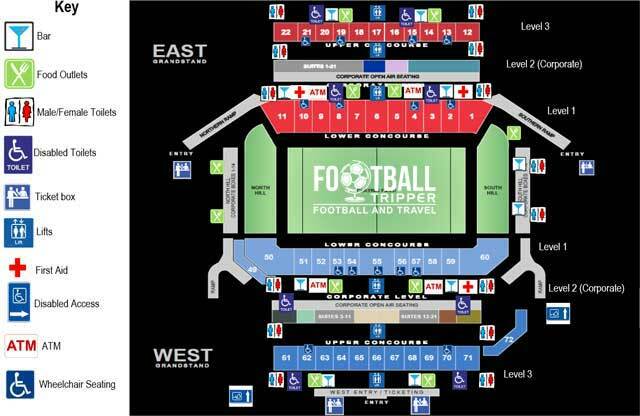 Please note that the above ticket prices are illustrative for the 2015 season and do not include booking fee ($4.35) and payment processing fee for some credit cards. Hunter Stadium is located within District Park next to the racing track within the area of Broadmeadow approximately 5.4km west of Newcastle. The red and grey exterior of Hunter Stadium’s main stand. 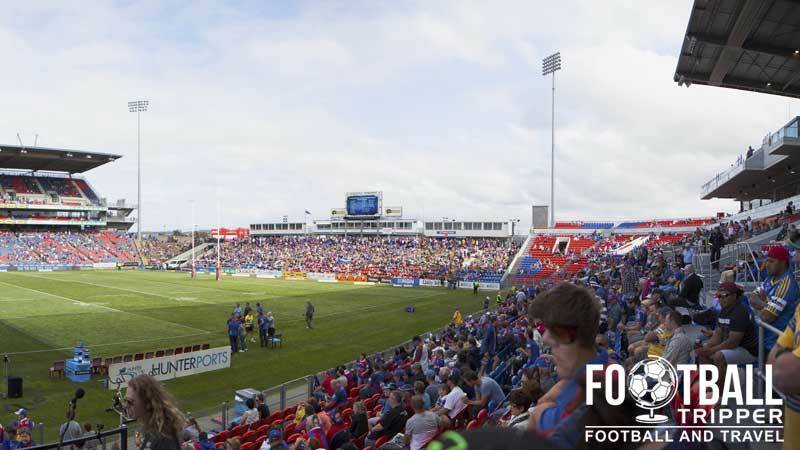 There are a limited number of parking spaces available at Hunter Stadium to fans on match day, providing that parking passes are purchased in advanced. Costing around $10.00 per vehicle the official website says that you can either purchase them from the box office at the ground, via the phone (136 100) or online from Ticketmaster (search for “hunter stadium”). Broadmeadow Station is the closest mainline railway station to Newcastle’s ground at a distance of approximately 1.5km away. The station is served by regular services from Sydney with a full list of stops and timetable available here. The closest bus stop to Hunter Stadium is the one at Turton Road just off of Young Road. This route is served by trains buses 111, 138, 231 and 267 during normal weekday hours. Just behind Broadmeadow Station there is The Premier Hotel which is good value for money, and south-west of the ground on Lambton Road there is The Executive Inn. Otherwise the more familiar choice are all back towards the sea-front where there is the likes of Hotel Ibis, Travelodge and Crowne Plaza.